Famous People: What Their Lives Reveal by George Kouloukis is a fascinating book loaded with lessons we need to grow into what we are called to be, to make life changing decisions, to face adversity, and to discern our path in life. The author brings together lessons from twenty-two famous people, from Ludwig Van Beethoven, Giuseppe Verdi, Mikhail Gorbachev, The Dalai Lama of Tibet, to Napoleon, Victor Hugo, Jimmy Carter, Nelson Mandela, and many others. The author looks into the lives of these people with diverse and unique skills, each from a unique background, and draws powerful lessons to help readers transform their lives and give it a healthy perspective. It is interesting how the author looks at life from the point of view of the seasons. There are bad days, but they do not mean that the good days won’t come. In this book, readers will understand that some of their heroes, if not all of them, experienced rough weather; they encountered the darkness of despair, but what made them famous? That is what this book is all about. It is an unconventional way to consider the question of what it takes to succeed or to achieve something — anything — of great worth. Instead of dishing out pieces of advice to readers and telling them what to do, the author allows the lives of great teachers, spiritual leaders, politicians, and intellectuals throughout the ages to speak to them. 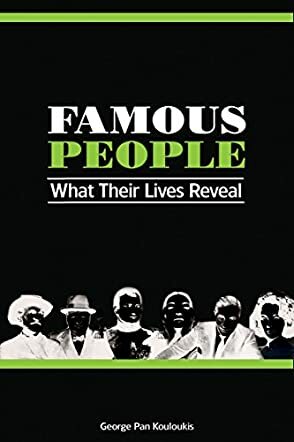 Famous People: What Their Lives Reveal is an insightful, beautifully written book that uncovers the gems in the paths of the famous people featured in this book. While it informs readers, it has a lot of motivational material to help anyone face the most difficult moments of life. The prose is beautiful and the book is well researched. It is both entertaining and inspiring.